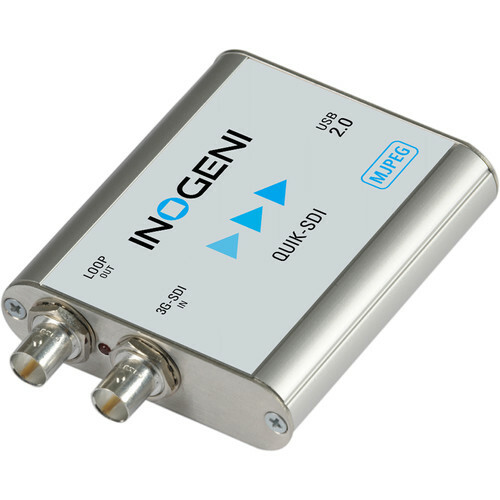 The INOGENI SDI to USB 2.0 Video Capture Card allows you to capture an SDI signal with audio to your Windows, Mac, or Linux computer. It was designed to let you bring a camera signal over into your computer for videoconferencing, streaming, recording, and editing. The card supports up to 1080p60 resolution on input and delivers the image to your computer in up to 1080p30 resolution, applying internal scaling and conversion if necessary. There's also an SDI loop-through output for use in various broadcast, medical, and other applications. The card is recognized on your computer as a webcam, so it's compatible with destinations such as Skype, Zoom, Hangouts, Facebook, and YouTube. UVC-compliant, it also works with all DirectShow-compatible software. The card is powered off the computer's USB 2.0 port, so no external power is required. Box Dimensions (LxWxH) 6.0 x 4.5 x 2.0"